Twelve Ordinary Men, John MacArthur’s book on the apostles, was a surprise hit. After the book stayed on the bestseller lists for over a year, Thomas Nelson suggested publishing a second volume, this one dealing with some of the best-known women of the Bible. MacArthur accepted the challenge and drew up a long list of possible subjects. “I admit that I chose the twelve women featured here by a completely unscientific process: I weighed their relative importance in biblical history alongside the amount of material I had already developed on each of them as I have taught through various passages of Scripture. Then I chose the twelve women who were most familiar to me.” Twelve Extraordinary Women is not exactly a sequel to MacArthur’s Twelve Ordinary Men, yet it bears many similarities. Like its predecessor (and unlike the majority of MacArthur’s books), Twelve Extraordinary Women is not primarily expository. Instead, it is a series of brief character studies. Like Twelve Ordinary Men, it is ideally suited for personal or group study, and is intensely practical. The format of the book will be familiar to those who have read Twelve Ordinary Men. 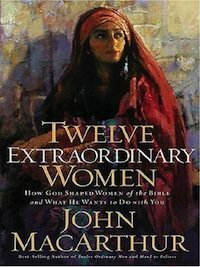 MacArthur spends a chapter discussing each of the women (though Martha and Mary share a single chapter) and shows that what made each of these women extraordinary was nothing they brought to God, but the work of the Savior in their lives. Each of them had a deep reverence towards God and trusted His promises, whether they looked forward to a time when the Savior would come, or whether they looked back at his death and resurrection. Some of them stood between the New and Old Testament eras, even witnessing with their own eyes the redemptive sacrifice of Jesus Christ. Each of the subsequent eleven chapters is a study of a particular woman, with MacArthur shining light on the Scriptural accounts of each subject. Each chapter is practical, showing how the virtues exemplified in the lives of the women can be applied to the life of the reader. The reader is show how he, too, can be extraordinary through the power of God. Twelve Extraordinary Women is a worthy successor to Twelve Ordinary Men. This book is both informative and inspiring. It will lead the reader to understand what each of these twelve women surely knew, that God was the truly extraordinary one, as He conformed such ordinary women to the likeness of their Savior. I highly recommend this book for both personal and group study.